Errands with young kids and toddlers can be tricky. And by tricky I mean can sometimes be the-worst-experience ever. When my oldest boys were almost 2 years old and 2 months old, I needed to go to the post office to pick up a package. We had just moved to the desert, and it was still summer time and sweltering hot. My oldest had only just started walking a few months earlier and was still unsteady on his feet. I had the baby in a carrier, and was I was hoping he wouldn’t poop. Because last time it had happened it got everywhere (and I mean everywhere) right smack in the middle of Target. Juggling purse, baby in carrier, and holding tight to my toddling-toddler, I made my way into the tiny waiting room of the post office package pick up area. Tiny and packed with people. We waited. And waited. And waited. The post office worker was searching for someone’s package, and was having trouble finding it. Lots of trouble. So I stood there, dripping with sweat, wishing I had a place to sit down, hoping my oldest wouldn’t try to sit on the floor, and praying that baby didn’t wake up and start screaming. And then my two year old started crying. Maybe it was the heat, maybe it was the crowd of people – I have no idea why, but he just started wailing. I maneuvered my way back outside (past the long line that had continued to form behind us) and awkwardly knelt down on the hot pavement, trying to find out what was wrong and see if I could get him calmed down. I gave him a piece of candy – I figured it couldn’t hurt, and might keep him calm enough to be able to get my package. We went back inside. I don’t know that he had ever had a hard candy before, and he wasn’t sure what to do with it. And he started drooling…all over the floor. Then the baby woke up and started crying. I decided to quit before things could get any worse (and forget the package- whatever it was couldn’t be worth all this!) and headed home. I’ve learned quite a few things since then, and have some tips for surviving errands with kids. So how do you survive the hour long wait in the doctor’s office or waiting room? I have a bag of tricks. Our boys each got these Pottery Barn backpacks around their first birthday. 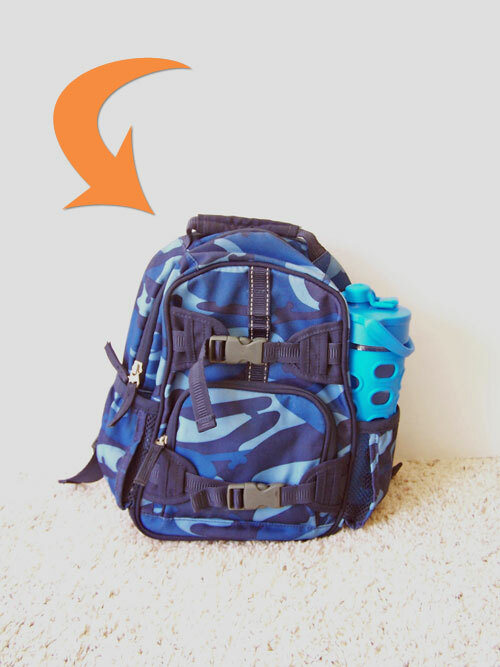 The backpacks are really durable – they’ve held up great with lots of use. It mostly started to help with church in the mornings. Instead of me lugging a bunch of little things around in a big diaper bag, we put the essential items in their little backpack. But we don’t just use it for church. If we are going on errands and know there’s going to be a wait, we grab these. This is the most important thing for me to be able to survive errands. If my boys have full bellies, things generally go well. If they are hungry, it’s pretty much guaranteed that they will be grouchy. This can be a tricky one for us because of how sensitive they are to a lot of foods. 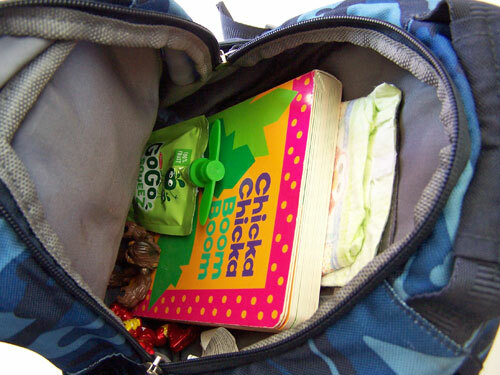 We love the Applesauce GoGo Squeezes because they are easy to throw in their backpacks and are just applesauce. Other things we throw in are bananas, cucumber slices, or carrots. Pack food that is easily portable and not messy. For water, we just started using Lifefactory Glass Water Bottles and I’m really impressed with them so far. My biggest concern was them breaking, but so far they’ve held up great to bumps and drops. 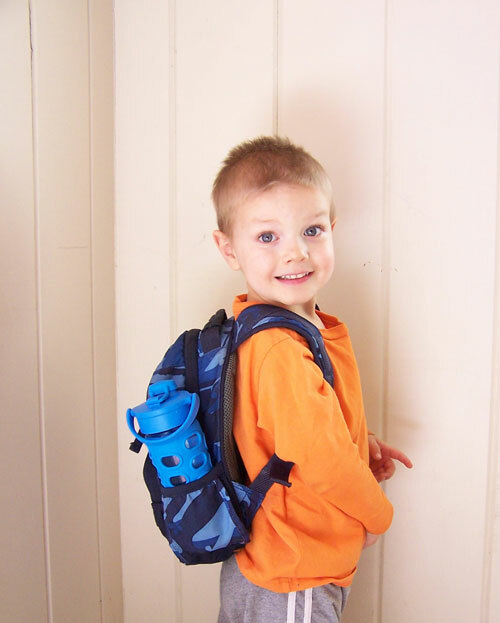 I also highly recommend the Camelbak Kid’s Water Bottles . That’s what we’ve used for a long time and were really pleased with them. The only reason we stopped using them is because we’re slowly phasing out some plastic stuff around the house because we think it’s been affecting the boys. The little Playskool figures are the perfect size to bring along for errands. I’ve found the key is to bring one or two small toys, but much more than that is too much to keep track of and ends up being a bigger hassle than a help. Another great toy to take along are felt finger puppets, like the robots from Monday. They are easy to throw into the backpack, and make for some fun play. I pick up the packs of tiny notebooks from the Dollar Store, and we keep one in each of their backpacks all the time. Sometimes the perfect remedy for a long wait is a place to draw silly pictures. 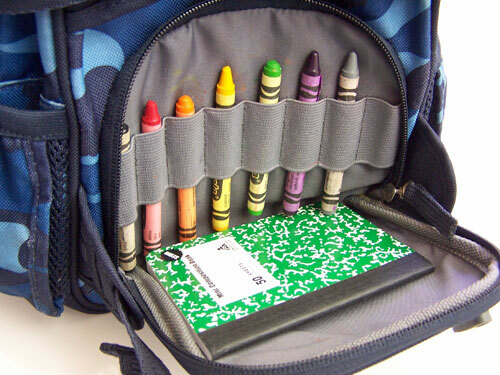 And another thing I love about the Pottery Barn backpacks is they have a nice little pocket with slots for crayons. Bringing along a favorite book can be a great way to survive long waits. We enjoy Chicka Chicka Boom Boom (Sean will spend a long time just looking through the pages and pointing out letters), but any small book that fits in their backpack works great. And my last and most important tip: Roll with it. Life isn’t perfect. Meltdowns happen. Sometimes you just have to do with the best you’ve got. It’s not the end of the world if your baby poops everywhere and your toddler drools all over the floor (though it may feel like it in the moment). Hang in there and roll with it. Great tips! 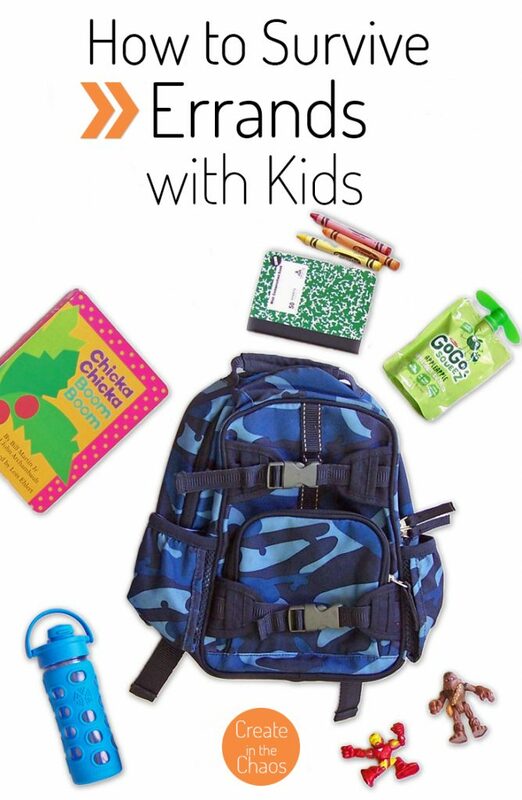 I like the idea of having a bag for each child! Yes it’s so nice! And they love being responsible for “their” stuff, it’s cute!